Modelled in the classic Playmobil style these figures stand 6” tall and come with accessories. Playmobil goes all famous TV and movie characters, and they look great!! Blister packed. Funko is proud to announce a historic partnership with PLAYMOBIL, one of the most cherished names in collectibles history. Funko – the largest stylized vinyl collectibles company in the world – and PLAYMOBIL are collaborating to pair the classic articulated, 6-inch ABS figures with exciting pop culture and entertainment licenses for a collector-focused line. As PLAYMOBIL’s first official licensee, Funko will have the opportunity to bring new and beloved characters to PLAYMOBIL’s nostalgic frame. there is obviously some issue with these figures in the UK FPi cancelled all orders and apart from a handful that seem to have got through there are non anywhere. 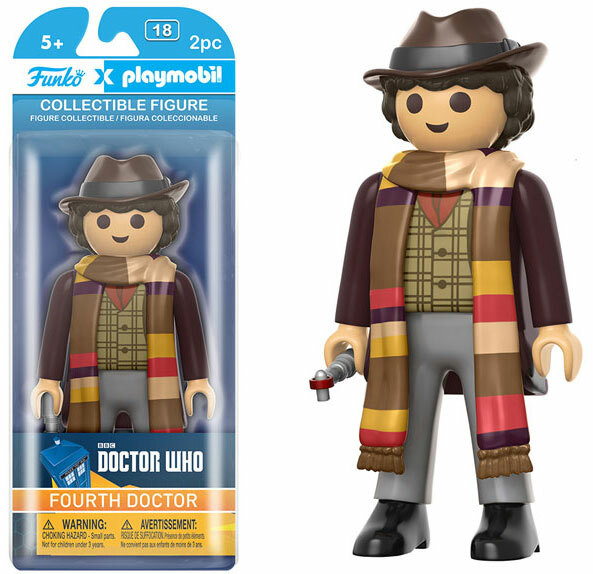 I pre-ordered both of these when they first became available on Forbidden Planet International – still haven’t received them! A few months after that, they became available to pre-order on Zavvi, which I also did. I received 11 over a month ago and 4 yesterday. They’re wonderful. Funnily enough, I was never a fan of Playmobil when I was kid! It was Lego all the way! Unfortunately Zavvi is stating that 4 has sold out and there’s still no sign of these on ebay or Amazon. Forbidden Planet International just cancelled my order, stating they couldn’t source them. I wonder if they ever got any in stock? FPI are usually very good for pre-orders, really disappointed as I wouldn’t have minded having 2 of each. I wish I had Pre-Ordered with Zavvi now! I would have had both figures & it would have been cheaper as well! Got mine yesterday, ordered from Zavvi in January. Nice figure although limited articulation. Same! Seem’s the US had a shipment & also available on ebay. Still waiting for the UK release? Picked them up at a convention. They’re large and hefty and neat. The 4th Doctor is really awesome. The 11th is kinda plain and could easily blend in with generic figures if it wasn’t for the hair and sonic. Actually just had an email from zavvi saying mines dispatched today! Mines just arrived (literally!) Awesome item! They are £12.99 at Zavvi and I believe they are free postage! Forbidden planet have reduced their prices to match now! True, but FPI are charging for p&p at £3.50! Fifteen quid!? I would have preferred them released it in their regular scale so it can be used with all their other figures…and they would be cheaper. I wonder why there are 4 Ninja Turtles figures, but all the other franchises only have 2? Because nobody would buy the Ninja Turtles if the set of four wasn’t complete I suppose. Having said that, there’s one turtle missing. I really like the 4th Dr and the Oompa Lumpa but the one next to it with the white hair looks like Jimmy savill. Haha, thats Doc Brown from Back to the Future! I thought that as well! When they were first mentioned back in mid-2016 I thought the price of £11 was steep. The RRP is actually £17.99 but FP are charging £15. There was talk of two-packs then, but obviously not now. I think maybe £8-£10 would be decent for these. I mean I can get a proper detailed and articulated Doctor Who figure for £15. No idea what to make of these, just really different. I can see why they brought them out as they are a part of a set of recognisable characters in TV and Film.